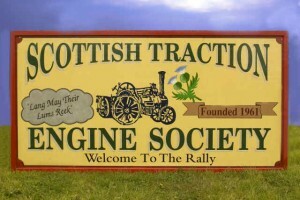 It is over fifty years since the Scottish Traction Engine Society was founded in 1961. The catalyst of the preservation movement in Scotland was the purchase of a Burrell traction engine from Wix, in Essex, in 1960 by the Tomkins Brothers from Glasgow. Wixie, as the engine was unofficially known, stood for a while on the garage forecourt and acted as a magnet to those interested in steam engines in general and traction engines in particular. As a result of discussions between two gentlemen, while tending to the health of Wixie at Tomkins garage, an inaugural meeting of the society was held in Edinburgh on April 22nd 1961. Fourteen gentlemen were in attendance and could be regarded as the founder members of the society, although of the half-dozen or so still living, none now play a very prominent part in the traction engine movement.